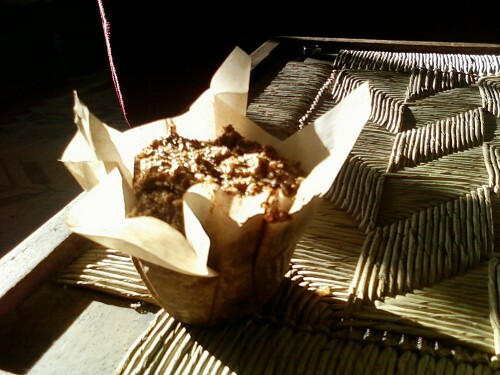 Click the “read more” link for a vegan version: a pumpkin pie spice muffin recipe my housemate & I thought up. The creator’s suggestion is to freeze them and grab one in the morning as breakfast. Preheat oven to 400° F and grease a 12-cup muffin tin. In a large bowl combine 1st 5 (wet) ingredients. In a separate, medium bowl combine dry ingredients (bran will be very fluffy when dry). Incorporate dry ingredients into wet, stirring ONLY enough to combine them (stop immediately or they won’t rise right). Add fruit, and spoon it all into 12 muffin cups. Bake 20 min**, until tops are firm. Let sit 15 minutes in the tin before removing; then, cool on racks (or just on their sides in their spots in the tin). *The creator’s note says: use 2 c milk for softer muffins, or 1 cup each water & milk for crispier ones. I had no milk at all, so I used 2 c water, and to make sure things stayed moist enough I bulked up the recipe a bit by adding 1 additional small egg, 1/3 c rolled oats and 1/4 c each chopped-up raisins, minced walnut, grated zucchini (for a moister muffin) and flaked coconut. They didn’t overspill their spots in the tin, and in terms of texture they turned out just fine. **Add 6-10 minutes if you include more fruit. For Vegan Pumpkin Pie Spice / Pineapple-Molasses Muffins, you can omit the eggs as well as the butter. This version is a little more like cake-muffins, and instead of the egg binding the muffin together, the pumpkin, carrot, and extra oats serve the same function. Make as for basic recipe, BUT omit the water until after you’ve mixed the wet and dry ingredients together. At that point, incorporate water by 1/4 cup until it’s wet but can still retain its shape if you clump into a ball (then stop!). Bake 30 min instead of 20, turning halfway through. NOTE: The extra body from the pumpkin and oats means you risk losing some depth, which is why the pumpkin pie spice and the molasses are important. For the molasses, go with black; and for the spice, I’m a fan of the blend I linked to because it’s punchy without being overwhelming. I do this because I have only 1 muffin tin and I need to take the muffins out before the 15 min is up so I can put another batch in. But it looks nice. Take the leftmost tip of the paper and fold it in toward the roll of paper (the crease will be along the edge of the triangles). Fold over again (not too loosely) a 2nd time, a 3rd time, a 4th time, and a 5th time. Cut. Fold the rectangle in half to make a square. Cut or tear along the folds. You should have 12 squares. Stuff the squares into the ungreased muffin tin cups and crease the sides of the to flatten them to the walls of the muffin tin cups before you add the batter.